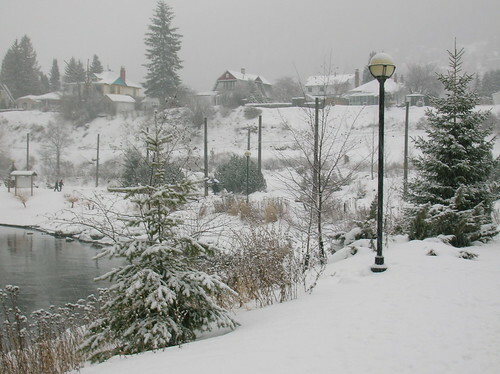 More Snow…with hats to wear and soup to share! As I mentioned before, it took leaving the Canadian Prairies to find out just how much I really do like snow!!!! 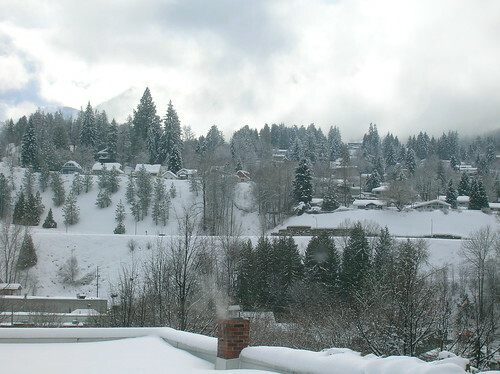 Of course, the weather gods seem to be more conducive to providing piles of the fluffy white stuff, when it is COLD but that certainly is a relative thing. I’ve also been reading about the wild winter weather down in the U.S. at several blogs, including: Annie’s, Opal’s and Sallee’s to name but three. On the plus side….a good time to break out all those gorgeous hand knit socks, scarves and mitts! Better yet, stay home and knit up a storm inside!!! Back to my own version of the ideal winter scene…. A generous (more than a dusting) of freshly fallen untouched snow. Christmas card perfect. Minimal wind. And the opportunity to enjoy winter’s wonderland, before it’s all gone again. Hope you enjoy some more winter pics. complete with plenty of snow. Also, some of my recent craft creations including another charity hat and one for Joe. Along the way, I found a very nice selection of hat patterns via some of the knitting blogs, some of them I have shared below. And to unthaw after a long walk, what could be better than some piping hot soup. I’ll finish off with a photo and recipe for an ideal “soup for a frosty week”…. Tuscany Minestrone Soup. 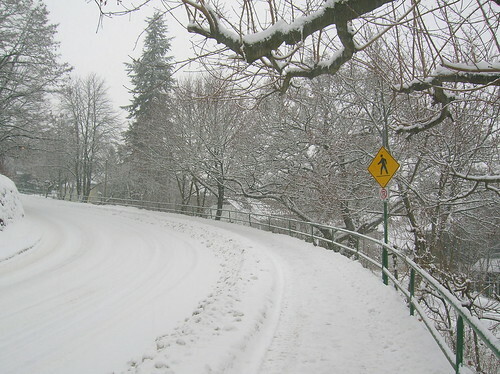 A snowy pathway, heading to the park…. 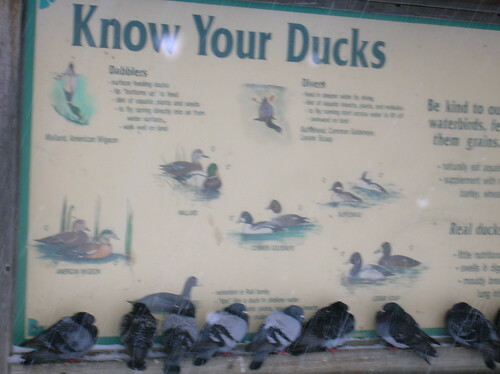 The pigeons were enjoying it too…. No skating on the lake though…. 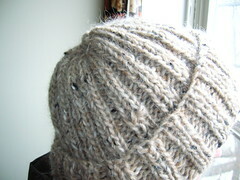 Made his with some beige tweed, Alafoss Lopi, from my rapidly dwindling stash. This was leftover yarn from the cardigan I am also knitting for Joe. Alas and a LACK of FO!!! This sweater is still not finished (it’s been in the works for over a year) but getting there, only the zipper and side seams to complete. Yikes, I think I missed Christmas on this one….sorry Joe! I did make lots of other nice presents though…. 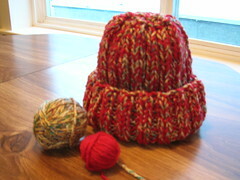 This very easy hat pattern, was found via Mary Anne’s blog: Miss Woolly Knits. She features many excellent patterns for smaller projects on her blog, including this lovely cabled hat and also these gorgeous handwarmers that she just completed. A great place to stop by, Mary Anne usually posts once a week, on Fridays (kinda like me!) and it’s always a pleasure to stop by and check out what she’s been working on and to enjoy the lovely nature photos and poetic quotes she usually also shares. Another great hat pattern, this time from Crazy Aunt Purl’s for a very easy and versatile beret that is elegant and tres chic. Check out the photos on this one, the girls look fab, the guys (you read that right) are a hoot!!! Along with this pattern, take a browse around Crazy Aunt Purl’s if you are in need of some real laughs, you won’t be disappointed. It’s no wonder she has so many comments (281 on one post recently!) this is one funny knit-crazed gal!!! In case the pattern link doesn’t go to that particular pattern(I was having a problem with linking) the beret was featured in her January 31st post. Last but certainly not least in the hat pattern finds, this one featured at Beth’s – Felt Like Knitting, the absolutely scrumptious Foliage Hat. Isn’t this a beauty? And Beth, you certainly did a great job of yours, loved the gorgeous blue you picked for this design, a LOT!!! That’s all for hats, at least for now. I’ve been really making some progress on the stash-busting knitting and crocheting, but I’ll leave my other projects for another post. Suffice to say, my ‘hat mode’ will not be continue forever, but what a great little project they make!!! Here’s the soup recipe and photo, as promised. Hope it helps to warm you up, after a trek in the great outdoors. 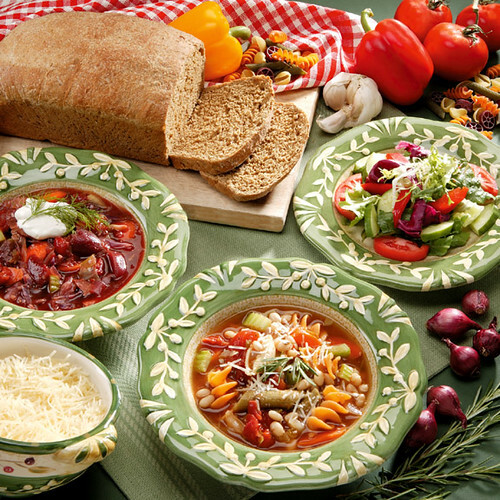 Enjoy the taste of Italy in this traditional Minestrone soup. Sprinkle each serving with freshly-grated Parmesan cheese and serve with crusty bread Add a good Italian wine for a true feast. Dolce vita!!! Serves 8. Wash beans and then soak in enough cold water to cover for several hours or overnight. Rinse thoroughly, drain and set aside. In a large frying pan, heat oil over medium heat and sauté the onions and garlic for 5 minutes. Add onions and garlic to soup pot. (Note-don’t rewash the frying pan, save the remaining oil to use for vegetables, see below). Add beans, soup stock and seasonings to soup pot and bring to a boil. Cover, reduce heat to low and simmer for 1 hour, stirring occasionally. While the beans are cooking, sauté the carrots, celery and cabbage in the fry pan for about 5 minutes over medium heat, remove from heat and set aside. After cooking beans for an hour (or until tender), add all remaining ingredients to the soup pot and simmer for an additional 20 minutes. Top each serving with grated Parmesan cheese if desired and enjoy!!! Reprinted from: Not Just for Vegetarians, Delicious Homestyle Cooking, the Meatless Way by Geraldine Hartman. All rights reserved. Your hats look terrific, G! That Alafoss Lopi yarn looks like it would be really nice to knit with. 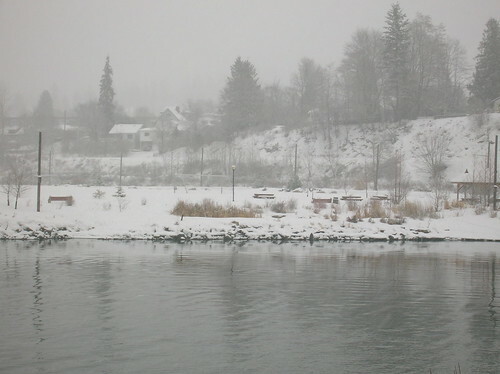 The snow photos are beautiful. You’re having wonderful winter weather. and your hats are lovely too! I can’t stop marvelling over the view from your kitchen window. It’s incredible. I, too, love snow. We’re getting heaps of it in Toronto this winter, and all around me I hear people grumbling, but I am really enjoying it. But Milo … not so much. The snow drifts are twice as tall as he is! I just love my new hat, it’s so beautifully made. I will enjoy wearing it for years to come, thanks to my wonderful and talented Ger. I just found your blog, and oh your meal looks absolutely delicious. I will have to save that recipe and make it soon. I’m glad you are enjoying your snow; it looks so peaceful. 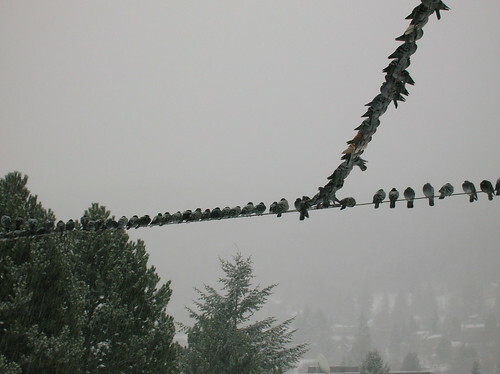 I love the birds on a wire picture. Hi Beth, Thanks for the kind words Beth! I love seeing all your projects in progress too. Hopefully more on the way. Bring it on!!!! Hi Tania, It is a pretty scene isn’t it? Poor Milo he must look so cute, tromping through the snow but I bet he doesn’t like it. Hi Julie, Welcome and thanks for the kind compliments. Hope you will stop by again. love the snow pics! 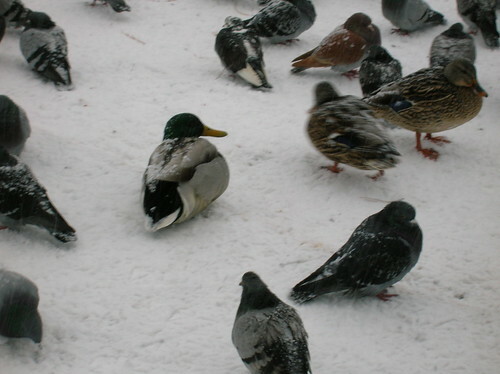 The birds look colllllddddd….they need sweaters! Stay warm.